So, a little background story to this entry. One of the things that I’m in charge of for my fraternity is maintaining the alumni newsletter. So, I had to send snail mail and a typed letter to the publishing company. Much to my annoyance, the nearest computer lab to where I was at the time was in Lincoln Hall, the music building. Well, I’ve never printed anything at Lincoln before, so when I selected printers, i accidentally sent it to 374 MTH instead of the MUSIC printer. I being off not-so-sound mind apparently managed to read that as 374 MUSIC, so I went up and began searching the third floor. Then I found this display. Realizing its worthiness for writing materials, I grabbed my camera and took a few photos. It seems the above pictorials date from ca. 1900, and were proposed designs for a combined Architecture and Fine Arts building. No word on where the building would have been built. This Collegiate Gothic design was proposed in the late 1920s, and would have been where Gannett Health Center stand today. Alas, the plan never saw the light of day due to budget cuts brought on by the Great Depression. This modernist structure was proposed in 1950, and would’ve been built where Noyes Lodge stands today. Considering this school’s record of modern architecture, part of me is glad this never saw construction. “A group of Cornell professors is urging the university to hold off on construction of Milstein Hall, citing concern about the economic recession and the building’s environmental footprint. In response, a group of Cornell architecture faculty is urging the university to move forward, saying the new building is needed to keep its top-ranked department accredited. The ultimate decision on whether to go forward with Milstein Hall lies with University President David Skorton, and he has not yet made that decision, Cornell spokesman Simeon Moss said Tuesday. Skorton announced a university-wide construction “pause” in October. The pause extends through the end of the fiscal year in June. Throughout its city approval process, Cornell officials repeatedly said that Milstein Hall is not subject to the construction pause. On Monday Mark Cruvellier, chair of the Department of Architecture, sent The Journal a joint statement in favor of Milstein. Cruvellier could not be reached for comment Tuesday. Milstein Hall has spent 10 years in the design and approval process, including two years gaining approvals from a variety of city boards. The city’s planning board and landmarks preservation commission have both signed off on the project. Milstein Hall is proposed as a modern, glass structure that will physically connect with Rand and Sibley halls and stretch across University Avenue toward the Foundry. Another cantilevered extension would extend out into the arts quad. A group of at least 25 Cornell faculty and alumni have petitioned the university to halt construction of Milstein, using The Cornell Daily Sun, other media and, today, the university’s faculty senate, government professor Elizabeth Sanders said. Those opposed include an architecture professor, Jonathan Ochshorn, and music professor Martin Hatch, who has spoken against Milstein before a variety of city boards over the last two years. Sanders contrasted the process and design for Milstein with Ithaca College’s new Park Center. The Park Center received the highest rating possible from the U.S. Green Building Council, a LEED Platinum, and cost $19 million, according to the Ithaca College Web site. Andrew Magre, project manager for Milstein Hall and the Central Avenue Parking Garage, said last month the total project cost would be approximately $54 million. Let’s consider the Park Center for a moment. The Park Center was a $19 million dollar project to build a 38,800 sq ft building  on the Ithaca College campus that was completed in early 2008 (it’s also the building that caught fire during the fourth of July celebrations). So, let’s consider some key differences between the Park Center and Milstein Hall. -Milstein is cantilvered and is connected to two structures that are a century old (Rand Hall) and ~110 years old (East Sibley). Park Center isn’t. The area was home to a green space that bordered a parking lot (and oddly enough, was not a suggested building site on the Ithaca College master plan , and to the contrary seems to throw off the master plan by cutting off the proposed green avenue through the main campus). -Milstein had to go through red tape hell after Paul Milstein’s original $10 million donation in 2000. Park Center was launched with a major donation from Dorothy Park in 2002 . The cost has gone from somewhere in the 20 million dollar range when first proposed to $40 million from a couple of years ago to about $54 million today. I wonder if that total includes the $2 million Cornell paid for University Avenue so they could actually build the damn building. -Milstein incorporates a parking garage, auditorium, and bus stop. Park Center has a large atrium, but otherwise it’s mostly offices and smaller lacture spaces . Park Center is LEED platinum (highest ranking), and Milstein is gold (second highest ranking). My issue is that the comparison does an unfair presentation of facts. If we were to plop Milstein out on the alumni fields or near the vet school, I bet it would be a lot of cheaper too. Park Center didn’t have the red tape issues or ambient environment issues that Milstein Hall has to deal with. My other issue is that some people are finding fault with the modern design. Let’s not start that crap again. In my own opinion. this is probably the least offensive design of the three that have been planned, if but just because it spares Rand from the wrecking ball. I’ll admit I’m no fan of it, but it’s less jarring than the previous two proposals. For one thing, architecture schools have a habit of wanting to be on the cutting edge of design (makes sense, considering building design is much of their field). Plus, the design is going to be different, because if people want to preserve Rand and Sibley the building has to build up or out. Being on the Arts Quad, I’m willing to wager some passionate people would rather burn the construction site down than let it build up. As much as this site is a Cornell construction monitor, and as I much as I actually like seeing new projects go forward, I’m really torn opinion-wise. Yes, I’d like to see the the architecture build-out so it can have more (badly-needed) space. However, with operations cuts across the board, I don’t see a good reason this should be spared. My concern, however, is that prices will continue to skyrocket, costs will be prohibitive and the project will have to go back to the drawing board again, and AAP will have a crisis due to its trip through red tape hell. I guess if Cornell is going to put off all non-current construction until at least June 30 (see Skorton e-mail), I’d better go back to campus touring. 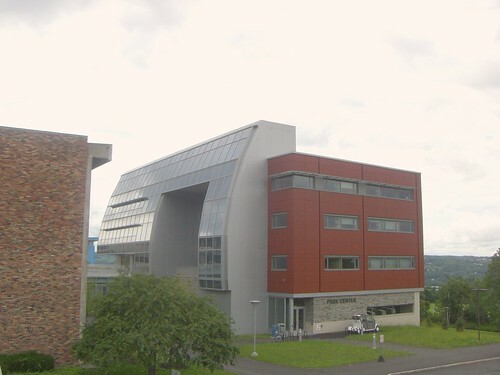 The Biotechnology building. So bland we didn’t even bother to give it a real name (or Cornell just hasn’t seen the right dollar amount—one of the two). The 150,000 sq. ft building was completed in 1986 (which might just as well be the height of modern-design blandness) by the firm Davis and Brody . I guess when comparing this to Comstock Hall, which was also built in the mid-1980s, this is a mild improvement. The building, as the name suggests, focuses on biotechnology research, such as genetics and molecular biology. The building’s use is strictly research, housing 36 faculty, 50 post-docs, and about 100 graduate students . Along with its primary use, the building houses a small dining facility and the Keller reading room. When it was first completed in 1931 , the Plant Science building was the largest single dedicated to plant research in the world (its about 170,000 gross sq ft . The building was designed by Sullivan Jones in the Beaux-Arts style, but I’d venture a guess that it’s a stripped Beaux-Arts style, because the ornamentation is quite restrained, and since it was finished at the start of the depression (the building did stay true to the initial design). Plant science serves as the home to the plant science and horticulture departments . The building itself isn’t particularly attractive, but the Minns Garden on the south side is the showpiece of the grounds. The garden is named for former professor Lua Minns, who used it in the 1920s as a practice ground for her students to do hands-on gardening work . However, the original plot of land was where Bailey Plaza and Malott Hall stand today. In case you’re wondering, the building between the garden and Bailey Hall is Liberty Hyde Bailey’s model rural schoolhouse, which was built in 1907 and probably lasted until demolition for Malott around 1960 . Stimson Hall was completed in 1902 and designed by locally-renowned architect William Henry Miller . While funded by Dean Sage (son of trustee Henry Sage for whom the Hall and Chapel are named), the building is named for Lewis Stimson, who was instrumental in the establishment of the Cornell Medical School. From 1902 to 1908, the medical school resided in Stimson Hall, but afterward it was relocated to New York City, where it still continues to exist today as Weill Cornell Medical Center. It should also be noted that part of the building was a morgue at this time. Stimson was designed with the intention of a second identical building facing south to be built were Day Hall currently stands; but for whatever reason it was never built, so the south side looks a little incomplete, with a terrace that faces out into a parking lot today (the area between the two buildings was to function as a courtyard). Today, Stimson Hall serves as the home of the Biological Sciences department, and the university Ombudsman (a person appointed by Day Hall to handle and address citizen complaints, according to Wikipedia ). When Kroch was built, Stimson was planned to be renovated into a library, but due to budget constraints, that was never undertaken. The tunnel between Kroch and Stimson was built to serve that purpose, but now it is only open for public use one day of the year—Slope Day . Speaking of Day Hall, we might as well briefly discuss it. To no one’s surprise, Day Hall houses most of the upper administration offices; for example, Skorton’s office is on the 3rd floor. The building was designed by Frederick Ackerman in a stripped classical style and completed in 1947  (offhand, I believe Ackerman also designed the Psi Upsilon and Sigma Phi fraternity houses fifteen years earlier). The building was dedicated shortly after completion to Edmund Ezra Day, Cornell’s fifth president (1937-1949). Before renovation, the building provided sleeping and bathing facilities on the third, fourth and fifth floors for faculty. For another fun tidbit of history, Day Hall was taken over in a non-violent protest for three days in November 1993 . The takeover stemmed from protests from Latino students over a combination of incidents and complaints with the university, including the vandalizing of a large art installation by a Latino artist, and lack of minority representation within Cornell faculty. And for the last time, there is no tunnel that leads from Day Hall to the Cornell Store.